Whale watching beachfront apartment with views from Long Reef to Gosford. Coachhouse on the Beach's Ocean Vista apartment features 180° views of Narrabeen Beach, including both Long Reef and North Narrabeen to Gosford headlands. The master bedroom boasts views of Long Reef and a large window to watch the sunrise from the comfort of your bed. Whether you're looking at a summer getaway or some winter whale watching, each self-contained apartment is fitted with full-sized kitchen, laundry services, free WIFI and Netflix. We're here to make your vacation everything you'd wish for, giving you your own piece of paradise for business or pleasure. Overlooking the grassy backyard flowing on to the beach you are only 3 doors down from patrolled lifesavers. Enjoy playing on the sand, frolicking in the water or simply sitting on the grass in the backyard, taking in the majestic views. This modern two-bedroom penthouse apartment (second floor) has breathtaking views along the beach to the headlands is a guest favourite. Watch the incredible sunrises and the beautiful sunsets from your lounge room, kick off your shoes and unwind, sink your feet into the sand down to the surf, without leaving your backyard or having to cross any roads. Conveniently located near public transport, The Coachhouse is perfect for those looking to see the sights Sydney has to offer with ease. The apartments face the beach, so enjoy the surf 24/7, throughout your stay. You could not pick a better location! This fully furnished unit has a large living room with a flat screen TV, complementary Foxtel Cable TV and Netflix, plus free high-speed wifi for fast web browsing and email access, private indoor washing machine and dryer, dishwasher, various bedding arrangements, including cots, sofa-beds and all the other essentials you’ll need on your vacation. A king-sized bed in the main bedroom is one of the comfiest around and we have clean sheets awaiting every arrival. If you're travelling as singles, if it meets your requirements, we can change the bed into two King Singles. The second bedroom is also fitted under the same bedding setup, and can be changed from its existing King bed to two King Singles. There is also a sofa bed in this apartment, which can sleep up to 6 guests. In the separate brand new, modern kitchen, there is plenty of workspace is available. In the kitchen, a fully equipped kitchen allows you to cook as little or as creatively as you desire. This unit is bathed in sunlight all day long, so enjoy a meal at the dining table as you gaze over the Pacific Ocean, admiring the sunrise over the sea; or use your laptop as you watch the waves role in watching the hues of the sky change throughout sunset. This apartment also has a separate area, with another table and relaxation area, allowing either separation from other members of your party, or a convenient workspace for busy people who still need to catch up with business or personal affairs, using a high-speed internet connection. For your safety and security, all access keys are security coded and cannot be duplicated, other than by our nominated locksmith, which ensures that previous guests are not able to access the apartment after their stay has finished. There is a very popular women's clothing shop next to the property, which acts as an easy landmark for guests to remember! There is also a manager on site to assist you with any requirements or issues. If you would rather have no contact with us, we're fine with that too and will let you enjoy your stay in peace! We'll try and make your stay as pleasurable and easy as possible. If you would like any information regarding the area, or the property itself, our friendly onsite manager would be more than happy to fill you in on anything you'd like to know as there are many restaurants, sites to visit and activities to do, that we are able to give you advice upon. We are only a phone call away and will probably see you during your stay. If you aren't too keen on the idea of human contact, we'll also be providing you with a booklet, summarising all the things we think you should know whilst staying with us, ready and waiting in the unit! This booklet will be emailed to you including directions from the airport, contact information and the most convenient method to contact us, prior to your arrival! The Narrabeen / Collaroy beachfront is a long sweeping beach with dramatic headlands at each end; Long Reef, which is a marine heritage site, which not only has birds flying off the cliffs, but also hand gliders. There is a fantastic walk around the Collaroy point, over the rock platforms, to Fishermans Beach (they don’t call it that for nothing! ), to the Long Reef Headland. Narrabeen also boasts world class surfing beaches, where international surfing contests are held. There are also a whole host of other beaches to explore whilst you're with us! Narrabeen is in the centre of the Northern Beaches of Sydney. It is easily accessed, either through the main road of the Northern Beaches (Pittwater Rd), or by going through the forest, along the Wakehurst Parkway - passing Narrabeen Lake's scenery, watching the Black Swans on the lake and the numerous bird life. The world class level walking track and bike track around the lake can be completed in various sections or you are able to do a complete circuit of the 8.5Kms (5 miles). The night life is also good, with a number of venues that host food and drink, as well as live music. The Sands hotel at South Narrabeen, plus the Collaroy Hotel (one of our favourites for a great pub meal) and the Collaroy Beachclub are all fantastic for an afternoon or night time beverage. All just 10 minutes' walk along the road or the beach, or 2 minutes by bus, Uber or taxi away, so you can enjoy yourself without worrying about having to drive. The world-famous Newport Arms Hotel, which overlooks Pittwater is only a 10 minute drive. A leisurely day out at Narrabeen Lake (5-10 minute walk), hosts activities such as wind surfing, fishing, paddle boarding or Kayaking. Tennis and Fitness Centres are close by and the NSW Sports Academy on the lake is 5 minutes' drive away, or pamper yourself at the local Day Spa. The opportunities are endless! Ocean Apartments are a family-based endeavour, intertwining professionalism, experience, design and modernisation to share the Australian beachside with people from around the world. Whether you're looking at a summer getaway or some winter whale watching, each self-contained apartment is fitted with full-sized kitchen, laundry services, free WIFI and Netflix. We're here to make your vacation everything you'd wish for, giving you your own piece of paradise for business or pleasure. Our love of the beach and surfing is one of the drivers for us to share this amazing experience at this property. Incorporating various techniques, processes and operations of hotels, we aim to provide a hotel experience in a homely environment. Each apartment is decorated with furniture, appliances and features we would need in a home of our own. We aim to give our guests all the luxuries of home and hotel, to allow them to relax from the second they walk into their apartment. We love hearing from our guests – before, during and after their visits, to ensure their stay is going as planned. We are constantly adjusting our apartments with feedback from guests, allowing us to continually improve your experience every time you stay with us. This block of apartments was built in the late 19th century, and still exudes the charm and history of this era, whilst having been renovated, with all of the sophistication and convenience of the 21st century. Having an enormous backyard which leads onto the sands of the surf beach is very rare in Sydney, with far less than 100 properties in all of Sydney having this feature. You will immediately feel at home in one of our renovated apartments. The Coachhouse was one of the first buildings built on the Northern beaches that is still standing. You can imbue yourself with comfortable scenic history. So whether you're looking at a summer getaway or some winter whale watching, each self-contained apartment is fitted with full-sized kitchen, laundry services, free WIFI and Netflix. We're here to make your vacation everything you'd wish for, giving you your own piece of paradise for business or pleasure. Walk straight from the backyard to the ocean, transport at your door, lifeguards next door, shops and restaurants down the road, various parks and lakes to boot - The Coachhouse boasts charm, character and convenience. We are uniquely positioned directly on the beach, providing our guests instant beach access from the expansive back garden. Only a handful of places in Sydney (and New South Wales) have similar access, however most don't have the additional luxury of being situated next to a Surf Lifesaver's Club. Even if you get tired of the beach, Narrabeen Lake is right down the road (<5 mins), offering a host of things to do solo or with a family. Home to pelicans, swans and cockatoos, all peckish for a feed, it's a great way to keep the family entertained after lunch by the lake or kayaking and biking around the lake. This property is conveniently located between Narrabeen and Collaroy. An iconic building and property, owning 30 Metres of beachfront, has its backyard continuing onto the patrolled South Narrabeen Beach, only 20 metres south of the Lifesavers Club. Each ground floor unit has its own level, private fenced yard. We are right on the ocean with 30 metres of beachfront sand. You cannot get any nearer or closer to the ocean if you tried. 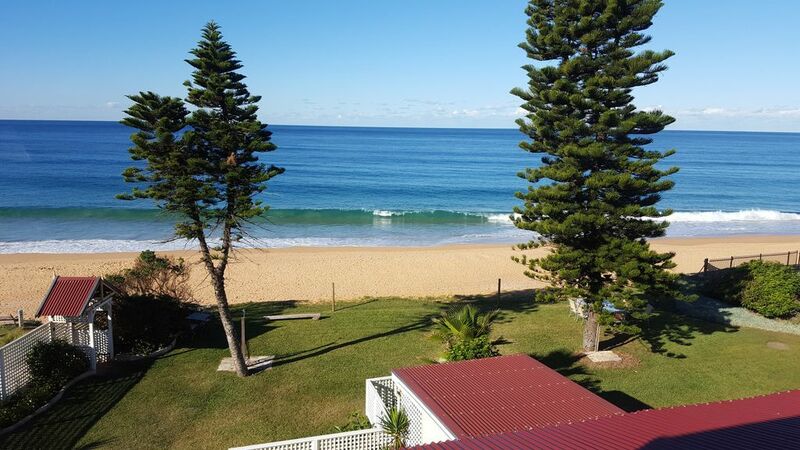 Being on the beach, this apartment has view up and down the beautiful golden sands of Narrabeen / Collaroy beach. Being an absolute beachfront property, the patrolled Surf Lifesaver's Club is only 20m away; you can safely swim at the beach and be looked after by professionals. Fantastic for families and children. Whether you're keen on exercise, or are after a place to barbecue with the kids, Narrabeen Lagoon can't be passed up. 5 minutes away and filled with swans, pelicans, cockatoos and kookaburras! Although not a mountain, you have a great view of Collaroy Plateau as it steeply rises from sealevel to a commanding outlook over the northern beaches. Step straight onto the sand in front of our property for swimming, surfing, wind/kite surfing or relaxing. Local ocean rock (swimming) pools are just a walk down the beach to Narrabeen or Collaroy. If you're lucky enough to visit during June - September, you'll catch dolphins and whales splashing around in front of the apartments. Narrabeen Beach's headlands act as an enclosed area whales love. Our backyard leads onto the sand and the ocean. Watch the waves from this apartment, see the headlands of Long Reef, Narrabeen and all the way to the Central Coast. We do not have a communal pool, however we are right on the beach, with the patrolled surf club 100m away. There are also 2 ocean rock swimming pools within walking distance. Our family of 5 had a great stay here, the views were picture perfect. Only reason I didn't give it 5 stars was because there was limited parking spots. So awesome to have the beach out the back yard, we couldn't get our 3 boys inside. The accommodation was clean and comfortable. Sonia, thanks for the great review; it really is a magical place and very unique having so much land right on the beach. When you were staying with us, the weather was absolutely fantastic and just being able to go straight into the ocean right at our property really is refreshing and great, especially being able to use one of the outside showers to rinse off after your swim or surf. The apartment that you stayed in certainly has fantastic views up and down the coast. We are pleased that you had a great time. Regarding the parking, as the weather was so good, there were more people going to the beach than usual; there is generally more than enough parking spots throughout most of the year. The next time you and your family want another beachfront escape, we would certainly love to see you again. This apartment has a fabulous view and is convenient to the flags for swimming safely at the beach. The owner was very welcoming. Choice of Narrabeen or Collaroy for restaurants, shops, fuel and supermarkets. Bus stop to city next door. We really enjoyed staying although watch your head in the bathroom and bedrooms. The furniture could be updated - tear in the lounge and under cushions not cleaned out but minor criticisms. I was wondering about the place as I walked to the front door and up the stairs. As I unlocked the door and climbed the cozy carpet stairs. The suite was awesome and the view incredible. A wonderful place thank you. Thank you. Thank you for your review. I know the front of the property does not do it justice, as we are currently in the middle of beautifying the front area. We have spent, as you know, an enormous amount of time and money on the huge backyard, which goes straight onto the beach. The apartment that you stayed in: Apartment 11, is very magical, with the amazing views up and down the beach and watching the sun and moon rise over the ocean. I am not sure if you saw the whales and dolphins that regularly appear in front of our place. I have spent time in the main bedroom, on the chaise lounge reading and each time the ocean and sound of the waves mesmerises me; usually I drift off to sleep. We are so pleased that you loved our place as much as we do. Looking forward to seeing you again on your next visit to the beach. We had a lovely family holiday at this property. The apartment is right at the top of the building like an attic- you cannot stand up straight in the bathroom as the roof is angled, and bedroom the same on one side- my husband hit his head many times on the ceiling getting out of bed! Pittwater Road is a very busy main road- it's hard to get a park and if it wasn't for the ocean noise, you'd hear traffic all night! But overall I would recommend this property and owner provided excellent info prior to arrival. Thank you! The apartment features 180° views of Narrabeen Beach, including both Long Reef and North Narrabeen to Gosford headlands. The master bedroom boasts views of Long Reef and a large window to watch the sunrise from the comfort of your bed. This entire beautiful, cosy, light filled, second floor penthouse apartment has been freshly painted and renovated, complete with breathtaking views along the beach to the headlands. Watch the incredible sunrises and the beautiful sunsets. Kick off your shoes and unwind, sink your feet into the sand down to the surf, without leaving your backyard or having to cross any roads. Conveniently located near public transport and ease of access. The apartments face the beach, so enjoy the surf 24/7, throughout your stay. The Ocean Vista is very sunny and light, located on Level 2 with glorious sweeping views to the ocean and up and down the beach, overlooking the headlands at either end of the beach. There is an abundance of birdlife; watch as a flock of Pelicans glide through the air, skimming the tops of the waves, the Sea Eagles and Hawks wheeling through the air and pouncing down for their dinner. You have your own private apartment, within a security building, with an intercom system, overlooking the beach and yard, with sweeping views from the lounge, kitchen and bedroom, from headland to headland, watch the incredible sunrises and the beautiful sunsets from your apartment. This property is absolutely unique and conveniently located between Narrabeen and Collaroy. An iconic building and property, owning 30 Metres of beachfront, has its backyard continuing onto the patrolled South Narrabeen Beach, only 20 metres south of the Lifesavers Club. We'll try and make your stay as pleasurable and easy as possible. If you would like any information regarding the area, or the property itself, our friendly onsite manager would be more than happy to fill you in on anything you'd like to know as there are many restaurants, sites to visit and activities to do, that we are able to give you advice upon. We are only a phone call away and will probably see you during your stay. We are located in the centre of the beautiful Northern beaches of Sydney, which boasts over 25 ocean beaches, with many more surf clubs. The Narrabeen / Collaroy beach has 4 surf lifesaving clubs. You could not pick a better location!